For the past nine years I've worked full-time in higher education, April has proved to be the most busy month of the year. I tread cautiously when mentioning the word, 'busy,' but year after year the month arrives filling up my calendar with late night events and other commitments that keep me in the office later than usual. Now that I'm a mother, I am so thankful this season is limited to this one time of year. 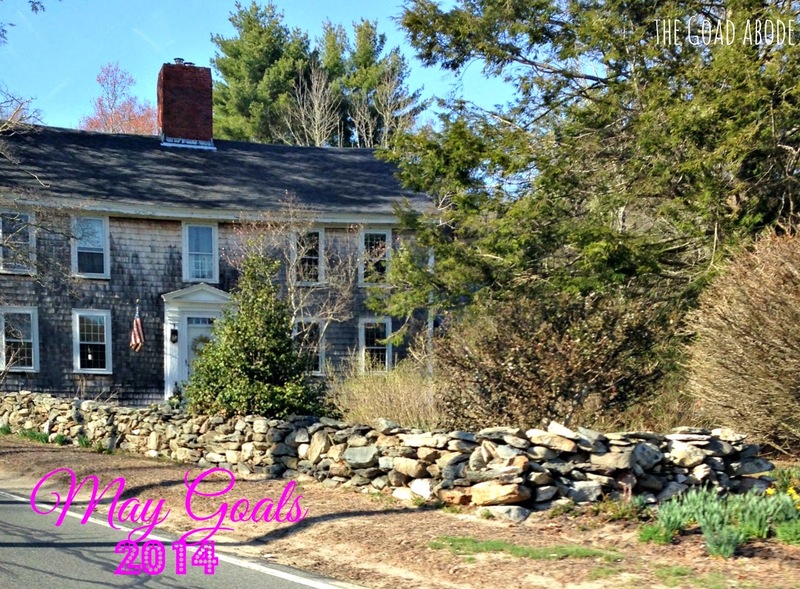 Each month, I'm making a list of goals and linking up with Hayley from The Tiny Twig. I find that making time-bound goals for myself, keeps me motivated. Have at least one lunch date per week with a colleague. I had lunch with a number of colleagues and it evened out to once/week for the month. Finish reading Barefoot Church. I'm still reading it...are you surprised? Find an Easter dress for Maggie. I bought a dress from ThredUp for Maggie for Easter and was so pleased with it. I'll be reviewing all of my purchases and experience with ThredUp in the coming week or so. Cut back on my sugar intake. I don't want to point any fingers at the jellybeans on my kitchen counter, but over the past few months I've let myself get away with eating too many sweets. I think nursing has something to do it. I'd tell myself I needed the extra calories and it was okay, but I'm weaning Maggie, so it's got to stop. To be realistic, this means only ONE serving/sweet treat per day. I realize that's still a decent amount, but that seems like a good start. Go on a date with my husband. Our anniversary is this month, so I'm fairly confident we'll do something to celebrate. Plan a summer getaway. Even if it's only for a weekend, I'd like to plan something for us to do as a family and look forward to. Earlier in the year, I declared "thrive" to be my word of the year. I have a confession to make: my life feels like about the farthest thing from thriving lately. I have told more than one friend recently I'm keeping my head above water. Between work and home life, I feel exhausted. While I'm not here to play the 'busy card' and list off all the things I do, I have to be honest and recognize that I feel overcommitted. Not only is it the busiest time of year in for me at work, but I am wrapping up my current job and preparing to transition to a new role in just a few weeks. I'm excited for the new opportunity. In order to thrive through this season that often feels overwhelming, I'm focusing on what's just ahead and taking each day as it comes. Spring is here and finally starting to bloom in our yard. I'm excited for the weekend ahead for a number of reasons. Alone they may not seem like thriving, but they'll allow me some downtime, family time and day off from work. First of all, I don't have any plans for a 24 hour period and that seems perfect. I will probably watch a movie or The Mindy Project once I put the baby to bed (the mister will be working). The next day I will spend time with Maggie (the mister has class) and perhaps we'll go to a park. Second, it's Easter weekend and one of the last of Maggie's first holidays. I love celebrating our Savior's resurrection and being reminded of the HOPE we have because of his death not the cross. Finally, it is a three day weekend because of Marathon Monday or Patriot's Day, as we know it in the Boston area. Last week marked the one year anniversary of the marathon bombings. Despite last year's tragedy, it is sure to be an exciting day in and around Boston. Last week, was my first experience traveling away from home (for work) as a new mom. I was fortunate to take Maggie with me to a conference last November, but was unable to do so this time around. As a result, I spent my first night (and subsequent nights) away from Maggie. Even though I knew the time would come eventually, I was still dreading it with every ounce of my being. I didn't expect to cry as we pulled up to the airport drop off area. I knew there would be tears at some point, but I did not intend to come unraveled while I was still with my husband and daughter. Tears continued on and off throughout the airports. I saw a child that looked close to Maggie's age/size and would well up all over again. Thankfully, I had a number of supportive colleagues who asked me about Maggie and how I was doing being away from her. Mothers empathized and offered words of encouragement and fathers asked if we were FaceTiming daily and how I was doing. I am grateful to the mom who talked to me about her perspective on stepping back from professional association involvement while her children were young. And to the colleague who told me she thought I was setting a great example by leaving the conference a day early to get home to my family. To be honest, it was hard to get away from my meetings to pump. I'm still breastfeeding, so I needed to excuse myself periodically to use my breastfeed pump. One day, I ordered my lunch with the group but asked for it to come in a to go container so I could take it to my hotel room. It felt odd and I didn't want to explain to my colleagues where I was going (but I figured some of them could figure it out). 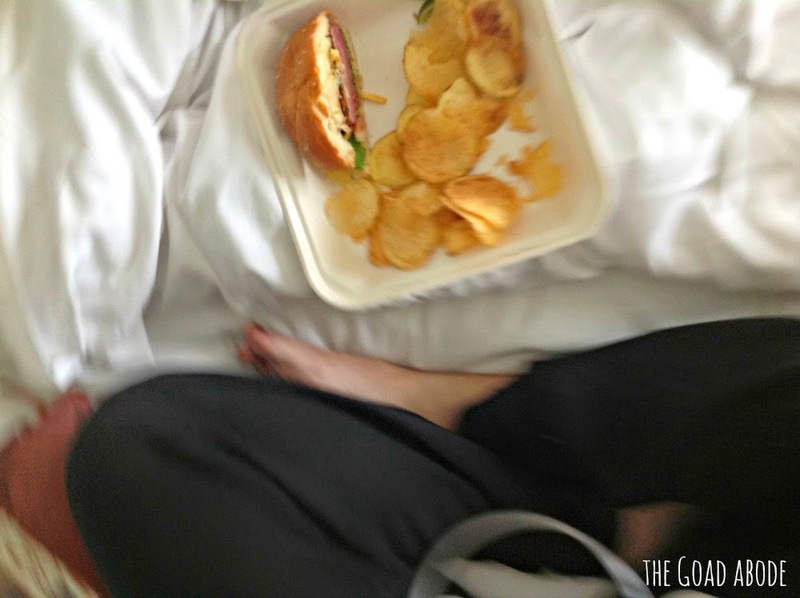 I had my own little picnic as I ate my ahi tuna sandwich on the bed all hooked up to the pump. I was so worried about my milk supply, both before the trip and while I was away. I was pumping multiple times a day in the months leading up to the trip to build up a 'freezer stash' that could be used while I was gone. While I was away from home, I used the "trick" of looking at photos while I pumped and did my best to stay hydrated; I even ate foods that claim to boost milk supply (oatmeal, spinach). While we experienced some re-entry challenges (i.e. Maggie woke up in the middle of the night), I am thankful the trip is over and I have a few months before we have to be apart again. The first weekend following my return was focused on time together, rather than my typical Saturday routine of cleaning and errand running. It's been important to take time to reconnect and let her know I'm not neglecting her. 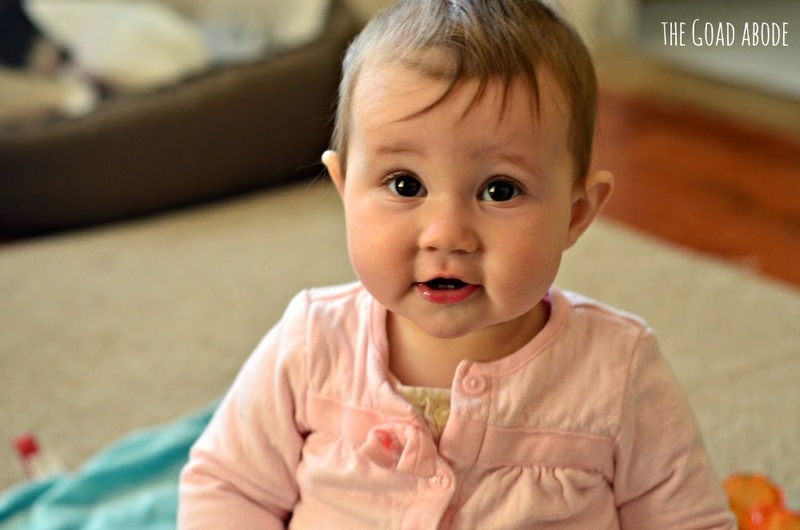 Have you traveled away from your child as a new mom (or mom to an infant)? Share any tips you may have in the comments section below. I believe it's so important to share our experiences and learn from one another. 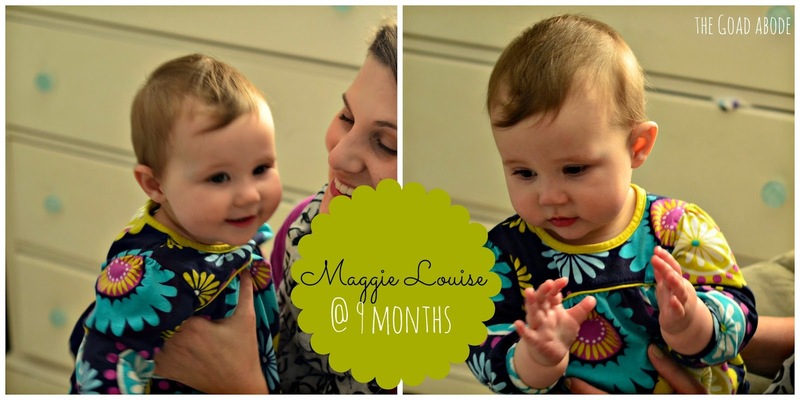 The past month with Maggie might be my favorite thus far. She loves to just sit and play with her toys. 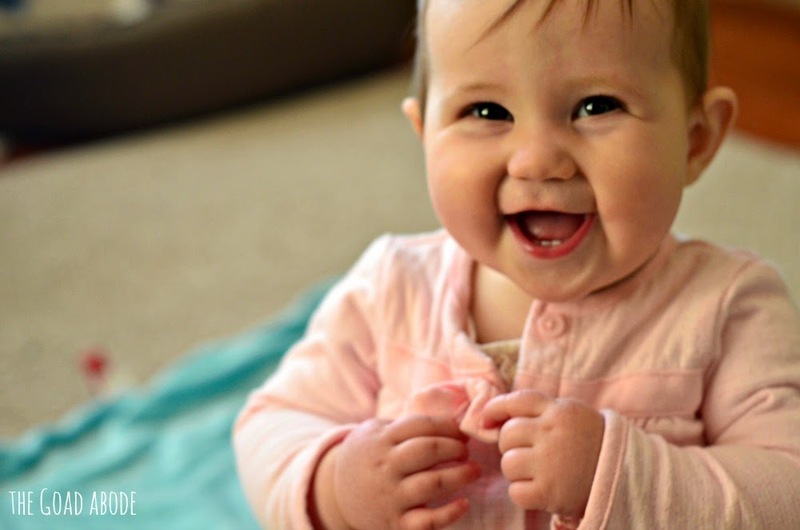 Her giggle is infectious and she engages more than ever, clapping along if music is playing or I start to sing. She also likes to bounce. Whether Maggie is sitting in her high chair or sitting on the floor, she will bob up and down when she's excited. One significant thing over the past month was our first night (and subsequent nights) Maggie and I were apart. I had to travel for a work conference so Brandon got his first taste of solo-parenting for a six day stretch. Maggie did fairly well (but I'll share more about my experience soon). Her first road trip of more than two hours. If you missed it, read more. Maggie's increased mobility. She isn't crawling, but she is scooting around on her bum which is pretty cute. It's almost imperceptible the way she can move from one side of her room to the other. She is acting on her curiosity more and more, as she reaches for books on a shelf, grabs for my straw and dumps out her toy basket. Watching her grow and discover new things is such a pleasure. We are so grateful to be her parents. Disclaimer: To all my stay-at-home-mom friends (and I have many! ), please know that I believe your job is work and I do not mean to downplay that role in anyway. I believe we've been called to our roles even if only for a season. Next week, I will have been back at work for six months following my first daughter's birth. Going back to work has been one of the hardest things for me, but it has also given me so much perspective. I think it's made me a better employee and taught me to treasure each moment I get to spend with Maggie. Lately, I've been thinking about the things that friends have said or done that encourage me as a mom who works (full-time) five days a week. Who doesn't love to hear an encouraging word? Motherhood can be a lonely place (at times) and I think it's especially helpful to hear words of affirmation from friends whether they have walked in your shoes or not. 1- Friends verbally offer to help with my daughter. From single friends to married without kids to friends with four children, so many have made it a point to say something like, "if I can help out with Maggie in anyway let me know" or "please know that I can be a backup to your usual childcare if needed." Those words are so welcome. They assure me that Maggie is loved by our community of friends. I still find asking someone to watch my child a bit uncomfortable, but at least I know if they've offered previously I'm not going out on a limb. 2- We (still) spend time together. It can be a challenge to find time to get together (my closest friends live a minimum of 30 minutes away), but we make a point to get together to catch up. Even though our conversations look different than they used to (with more interruptions), I am so grateful for a lunch date or walk with a supportive friend. 3- Friends ask me about my job. Whether they work or not, my friends know my job is important to me and often ask how it's going. Having the freedom to talk about the challenges that come with balancing all that's been happening has been so helpful. 4- They extend grace when conversations are interrupted or plans have to change. Before I became a mom, I thrived on efficiency. I think it was a bit of an idol, so it's been hard for me to learn that things take longer with a baby. Along with things taking longer, comes changing plans and I've had to cancel plans due to sickness or naps gone awry. I'm so thankful for the friends who generously extend grace to me when I have to call something off or tell them I am running very late. 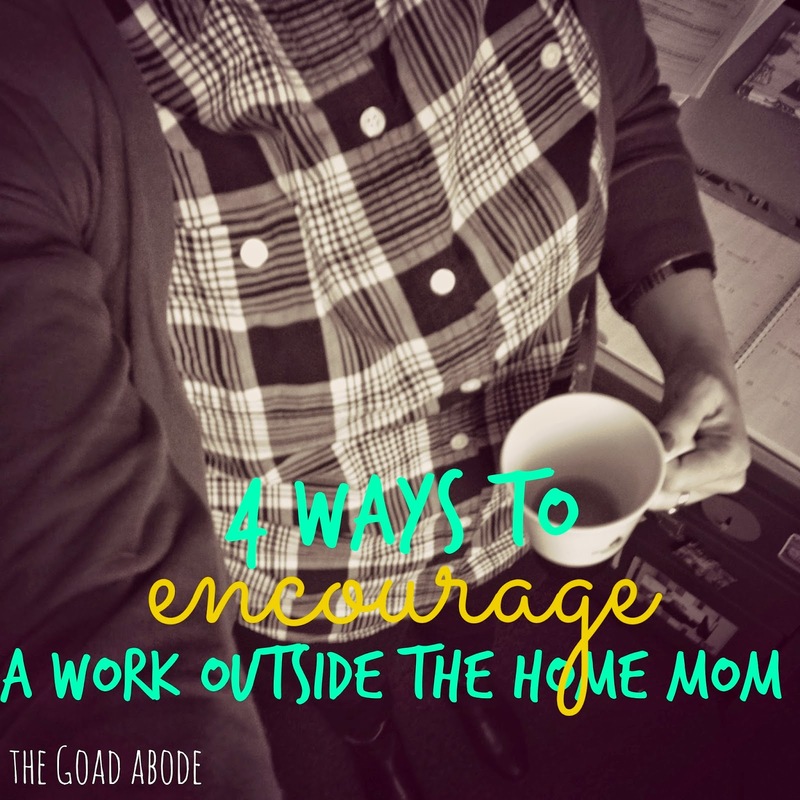 Do you have other ways to encourage a working mom you would add to the list? March feels like it was a whirlwind month and I have a feeling April will be the same story. I'm traveling for a conference for work this weekend, which you may have picked up on already if you follow me on Instagram. Mornings I can drink my coffee in a ceramic mug at home. In other parts of the internet, I've enjoyed and/or been encouraged by these posts. I've been using this lip stain thanks to a tip from Kim. These Target secrets seem true to me! I'm pumped for Hayley's new children's clothing line, Wildly, Co. This mother's perspective on using her computer around her kids. Considerations on an organized closet. I'm really looking forward to the Thrive Moms Virtual Retreat. This interview with Kay Warren. 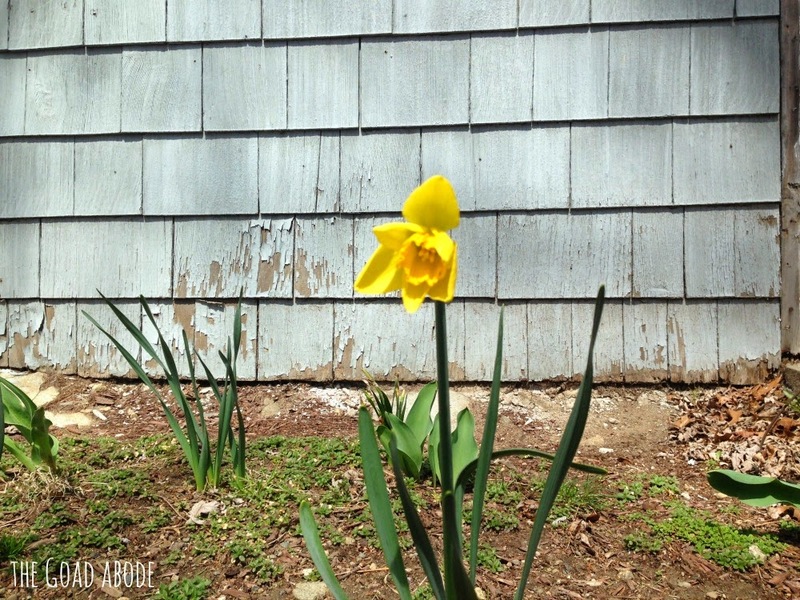 It's the first day of April and finally feels like spring in New England! The sun was shining and there is no snow on the ground...I'll take it! The month ahead is going to a busy one in our house. Both my husband and I are traveling, so I know the month will fly by. Looking back at my March goals, I am feeling pretty accomplished. I was able to complete more goals than in the previous two months. Let's hope I can build on this momentum. Introduce Maggie to two of her great grandparents. We had a great visit with family in Northern Virginia last month. Continue meal planning on a weekly basis. I was kind of a slacker in the meal planning department. Start a St. Patrick's Day tradition. We talked about the how St Patrick used a clover to explain the Trinity and at a yummy dinner of corned beef and cabbage (both of which are traditions I hope remain). Send a bag of clothes into ThredUp (they sell excellent condition name brand clothing). I mailed the package today! Go for at least three walks per week. Maggie loves spending time outside, so I'm hoping as the weather warms up we can go for a walk after work and on the weekends. Have at least one lunch date per week with a colleague. I've found that making lunch appointments with colleagues is a simple way to re-energize during the workday. I also have several colleagues who are parents and it's fun to get together and talk about our kiddos! Find an Easter dress for Maggie. I have made no attempt and while I know she doesn't need another dress, I would like to find a cute dress for her to wear on Easter Sunday and to a wedding next month.